It was the perfect evening for it – a bright almost-full moon that dipped in and out of clouds, a light breeze and a slight chill to the air, that all added to the anticipation. 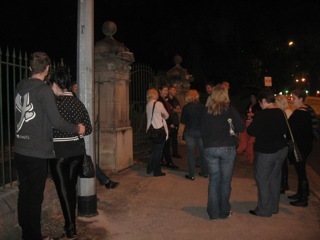 We met in front of the beautiful carved sandstone and wrought iron gates of the South Brisbane Cemetery at Dutton Park. We were greeted by our tour host, Jen, who was assisted on the evening by a gentlemen called simply (and mysteriously) "The Porter". Torches distributed for the duration of the tour, Jen proceeded to lead the group through the cemetery, stopping at graves of interest to tell the stories behind the words on the gravestones. 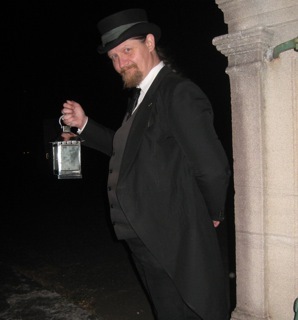 The Porter, bearing his lantern, brought up the rear – shepherding the group through the surprisingly large cemetery grounds. We all found it fascinating and the stories really brought "old Brisbane" to life. I do have to say though, I found there was something a little bit spooky about the section of the cemetery near the buildings. It's the lowest part of the cemetery and towards the middle of the grounds, with a tall native pine and other massive trees that dominate the site. Whether it's just the lingering dampness of the area that was formerly a marsh, the enourmous trees that tower over this part of the cemetery giving it an ambience that makes you feel reassured that you are not alone, or the stories Jen told us of strange goings-on related by former grave diggers and her own reported sensation of being watched a few times, it's an eerie spot. While none of our group actually had any ghostly encounters on the night (thank goodness! ), none of us seemed keen to linger in this area for too long. To learn from Jen that this section is unconsecrated ground and then to hear the stories of those buried there encouraged me even more to stick close to the others and not dawdle. 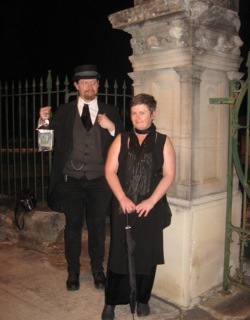 Even if you're not into the creepy aspect and are more level headed, it's a very entertaining tour, full of historical facts about the cemetery itself and interesting stories about the Brisbane of former times that relate to the cemetery. The two-hour tour seemed to go quite quickly, which is always a good sign. 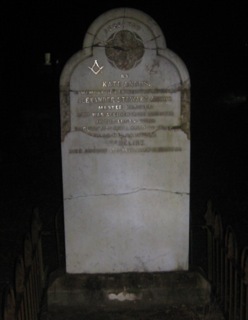 Even better, a part of the price of the tour goes to the restoration fund for broken gravestones. For tour bookings, click here. The cemetery itself, as an extensive tract of green space close to the city, is worth going back to check out during the daytime too, with lots of lovely established trees, interesting gravestones to read by the light of day, and a path that leads down to the river at the lower end. Personally, I plan to go back during the daytime to see if I can personally confirm the stories of clanking chains reportedly heard by many at 11am! Sounds like your auntie was a fun lady Katy! I used to love visiting cemeteries. 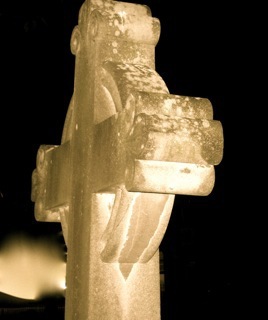 As a child my Aunty used to take my sister and I for "late night" tours of the cemetary near her place. We would read the names and dates and make up stories imagining who the people were and what happened to them.